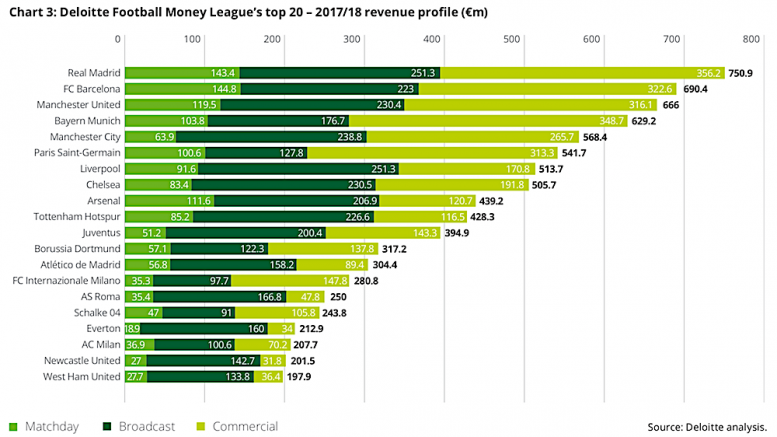 The world’s top 20 revenue-generating football clubs include four from the North West of England, according to the 22nd edition of the Deloitte Football Money League. Manchester United are third, Manchester City fifth, Liverpool are seventh and Everton 17th. Newcastle United in the North East are 19th. Manchester United were knocked off the top spot by Real Madrid, but the English Premier League continues to dominate the football revenue league. For the 2017-18 season, the combined revenues of the global top 20 grew 6% to a record €8.3 billion. Real Madrid return to top spot for a record 12th time, and the first time since 2014-15, generating €750.9 million (£665.2 million) in revenue. Manchester United slipped to third with revenue of £590 million, having been first last year. Manchester City, with £503.5 million, retained fifth position for the third consecutive year. Liverpool climbed two places to finish seventh with revenue of £455.1 million, after impressive total revenue growth of £90.6 million. Everton, with £188.6 million, ranked 17th in the world by revenue, the club’s best ever Money League position. Sam Boor, senior manager in the Deloitte Sports Business Group, said: “Despite Manchester United’s two year reign at the top of the Money League coming to an end, the financial performance of North West clubs continues to impress. “The region has the same number of clubs in the top 20 as the best performing country outside England (Italy: Juventus, Internazionale, AS Roma and AC Milan). Dan Jones, partner in the Sports Business Group at Deloitte, said: “European football remains a bull market, with annual revenue growth of almost €450 million in this year’s Football Money League. “At the top, we have seen Real Madrid shatter records, becoming the first club to break the three-quarters of a billion euro mark and claim a record twelfth Money League title in the process. “Manchester United slip to third place in this year’s Money League after two years in top position, despite a return to the Champions League in 2017/18 and overall revenue growth of 2%.